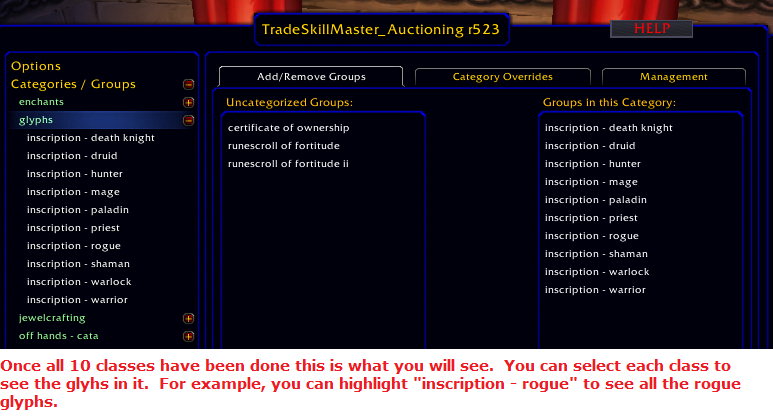 TradeskillMaster is currently the most powerful tool an auctioneer can use to make gold in World of Warcraft today. It has a steep learning curve but time spent initially is handsomely paid off. 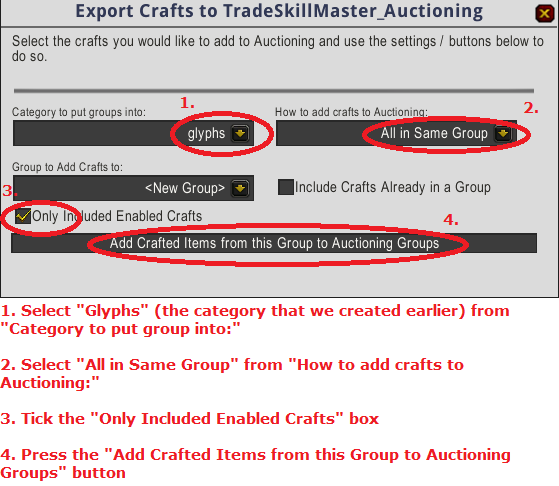 In this post i will show you the step by step process that i used to set up TradeskillMaster for auctioning glyphs. It need only be done once. 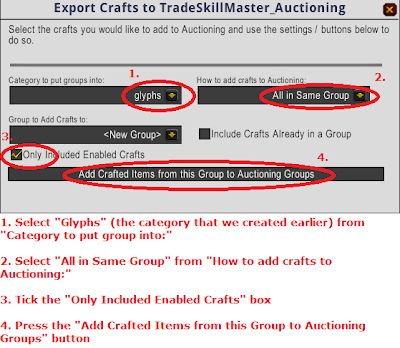 I can do it in 5 minutes though someone new to TradeskillMaster will take longer. 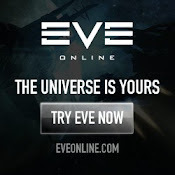 My aim is to post a maximum of 2 single glyphs or each glyph at a minimum price of 40 gold, a fall back price of 600 gold and to undercut by 10 silver. 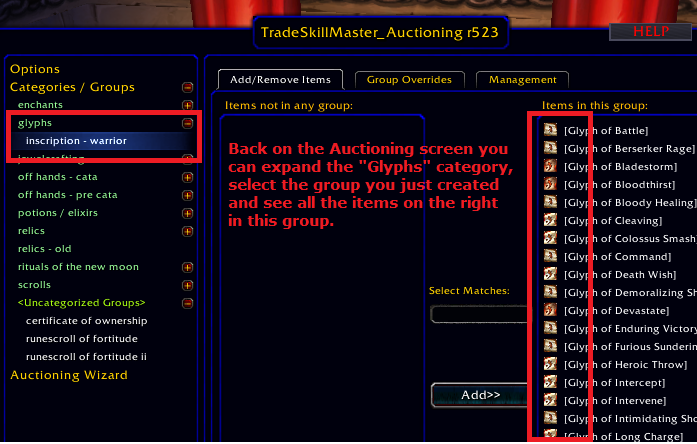 This takes me to the Auction Group Screen. 2. 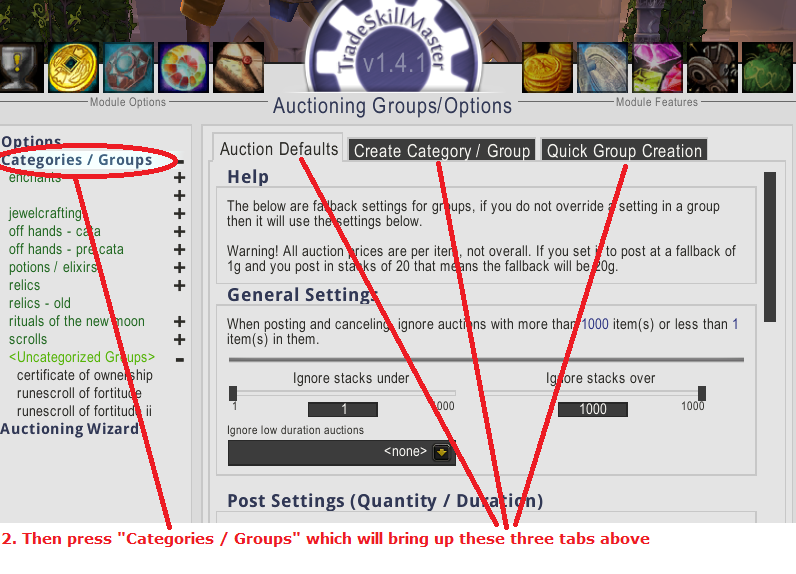 Select the "Categories / Groups" on the left hand side to bring up the page with the three tabs at the top: Auction Defaults; Create Category / Group; and Quick Group Creation - as shown below. 3. 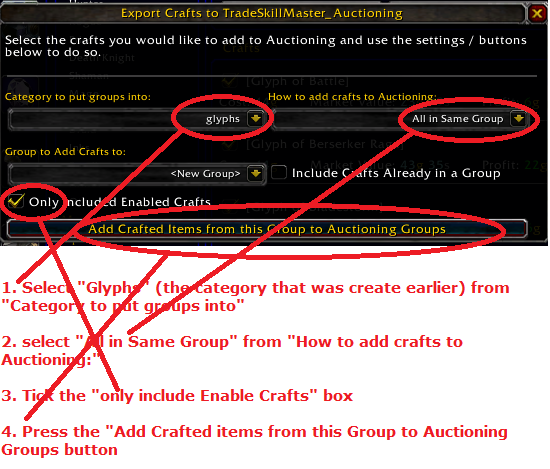 Select the "Create Category / Group" tab which opens the Category / Group creation window as shown below. 4. In the field titled "Category name" i type the name of the Category i want to create, in this case "Glyphs" and then press "Okay"
and, as the graphic below shows, that creates a new Category called glyphs. 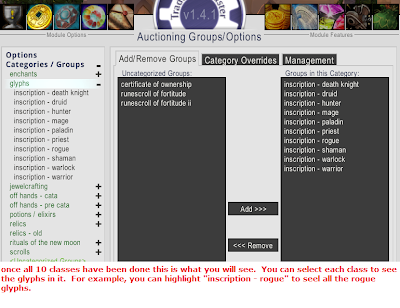 Now i need to provide some pricing and posting paraters to my newly created category. 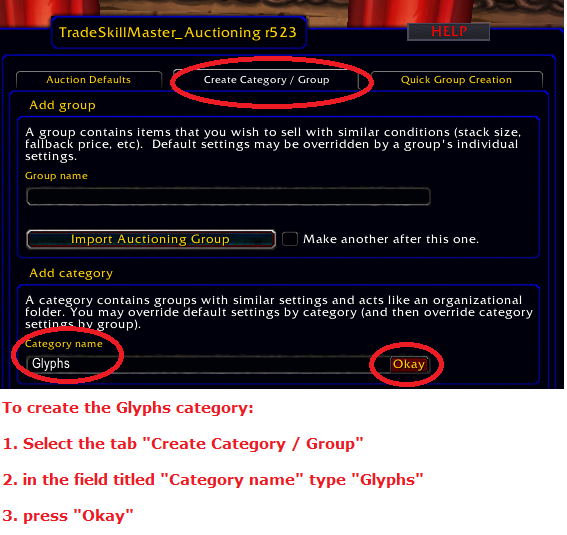 Because i use the same pricing and posting parameters for all my gylphs i can create the pricing and posting parameters for the category and then have this applied to all the glyphs i put in this category. 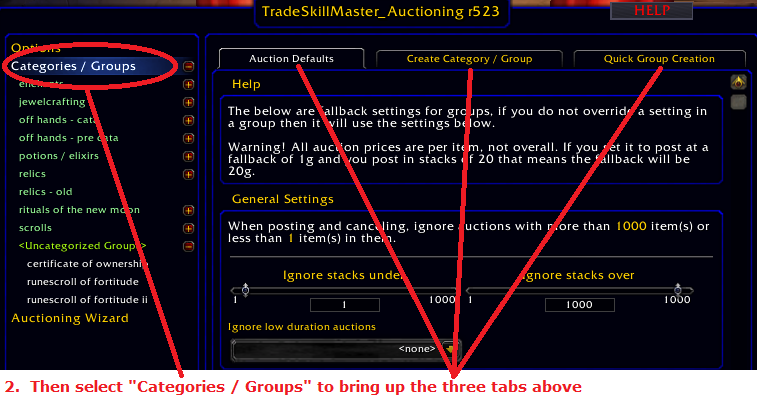 (TradeskillMaster allows you to set Category paramaters and Group parameters, and you can dictate which ones dominate). From the above graphic again, i select the newly created "Glyphs" category to bring up the Category window, and then select the "Category" override tab as shown below. 1. The top part is called General Settings - i leave the defaul values in and scroll passed it. 2. Under "Post Settings" i: set the "Post time" for 48 hours; set the "Post cap" to 2 (by rightclicking the input field, deleting whatever number is there, inputing 2 and then pressing enter); set the "Per Auction" to 1 (by rightclicking the input field, deleting whatever number is there, inputing 1 and then pressing enter). 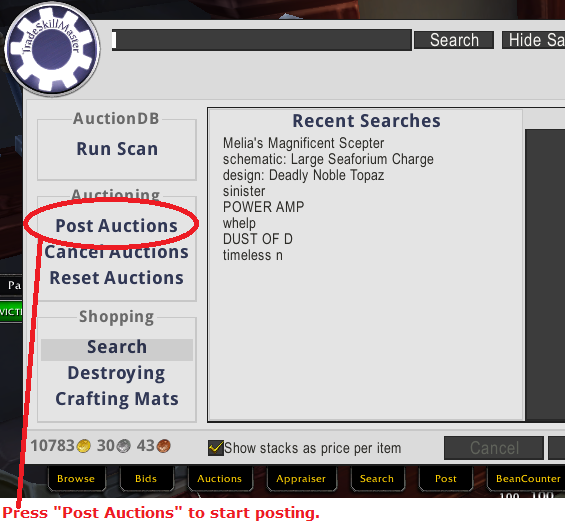 The text above should change to "Auctions will be posted for 48 hours in stacks up to 1. A Maximum of 2 auctions will be posted". 3. 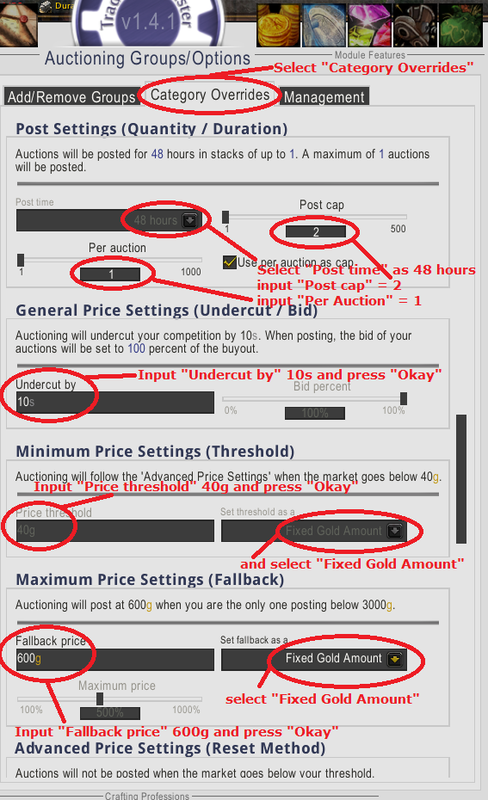 Under "General Price Settings (Undercut / Bid)" i set the "Undercut by" to 10s by rightclicking the input field, deleting whatever number is there, inputing 10s and then pressing "Okay" which pops up. 4. 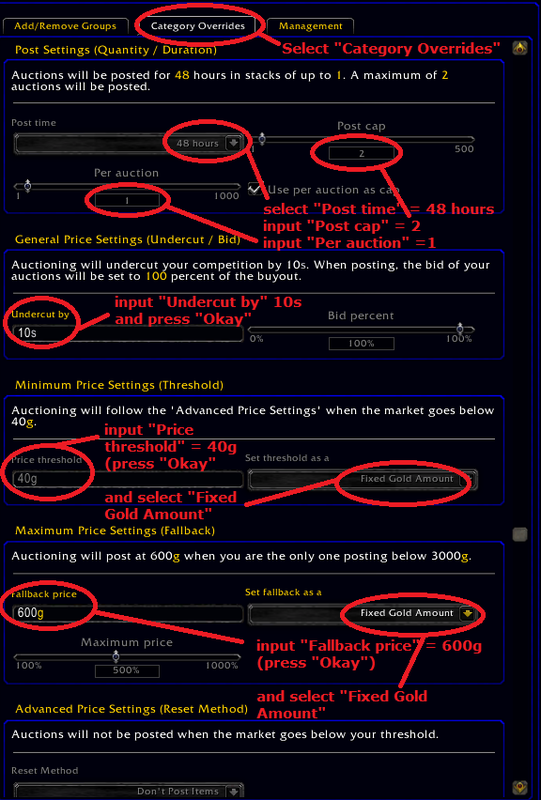 Under "Minimum Price Settings (Threshold)" i: set the "Price threshold" to 40g by rightclicking the input field, deleting whatever number is there, inputing 40g and then pressing "Okay" which pops up; and in the "Set threshold as a" i select "Fixed Gold Amount". 5. 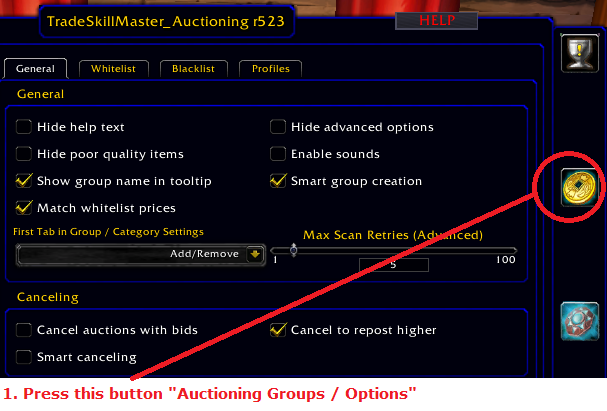 Under "Maximum Price Settings (Fallback)" i: set the "Fallback price" to 600g by rightclicking the input field, deleting whatever number is there, inputing 600g and then pressing "Okay" which pops up; and in the "Set threshold as a" i select "Fixed Gold Amount". 6. i leave the default parameters in for the final two sections: "Advanced Price Settings (Reset Method)" and "Reset Scan Settings". 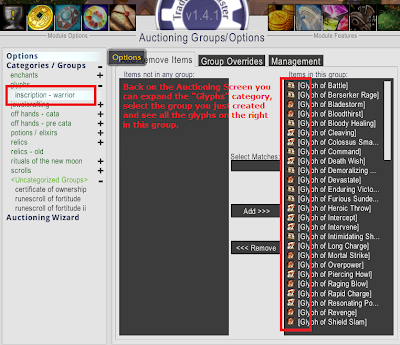 and that is the pricing and parameters set for the new "glyphs" category. 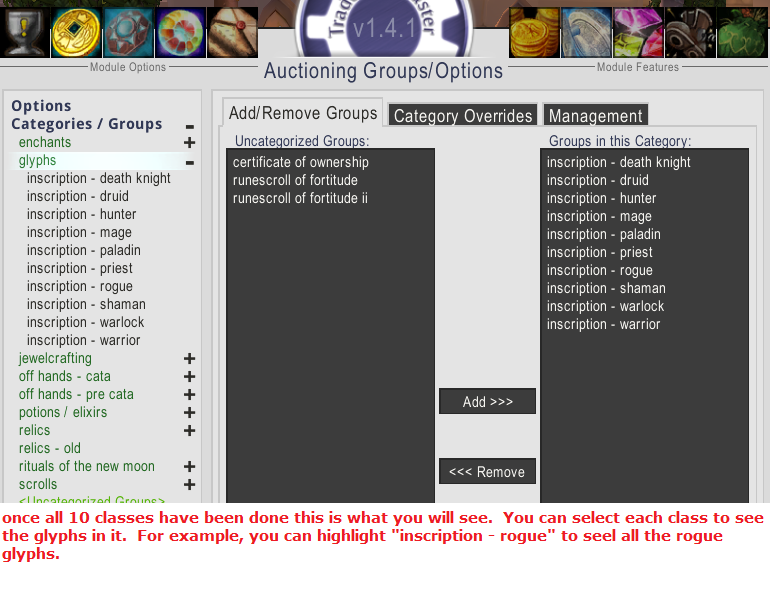 all i need to do now is populate this Category with items - in this case glyphs. 1. I press the Inscription Button on the left hand side, as shown in the graphic below. 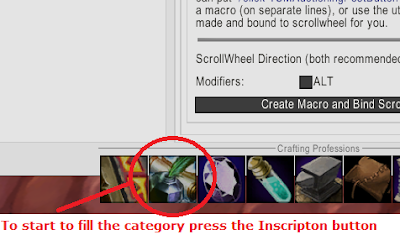 This will bring up the crafting window. 2. I select the first class, which in this case is "Warrior". 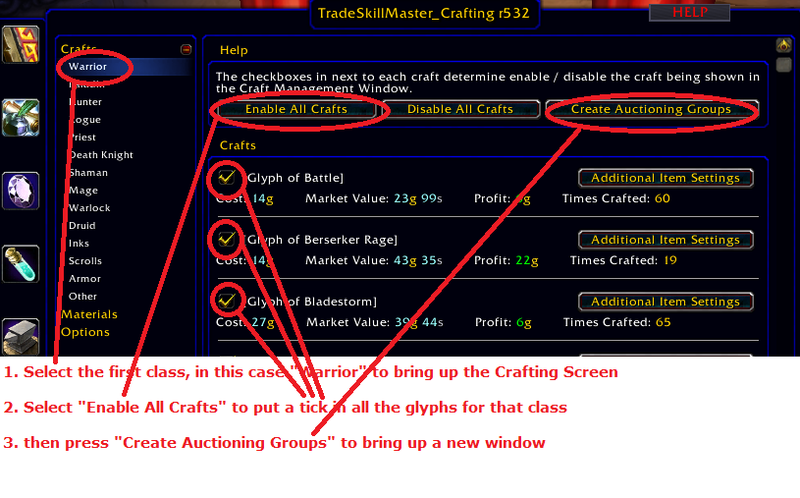 That will bring up the Warrior glyph crafting window as shown in the graphic below. 4. I then press "Create Auctioning Group"
this will bring up a new window to create the auctioning group - as shown in the graphic below. What we want to do is create teh group and place it within our new "glyphs" category and so have the Category pricing and posting paratemers apply to this group. 1. 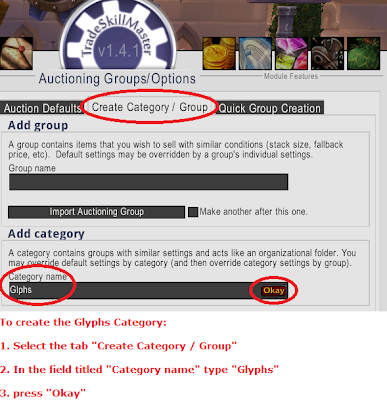 In the "Category to put groups into:" select "glyphs" (or whatever you called the new category that was created earlier). 2. 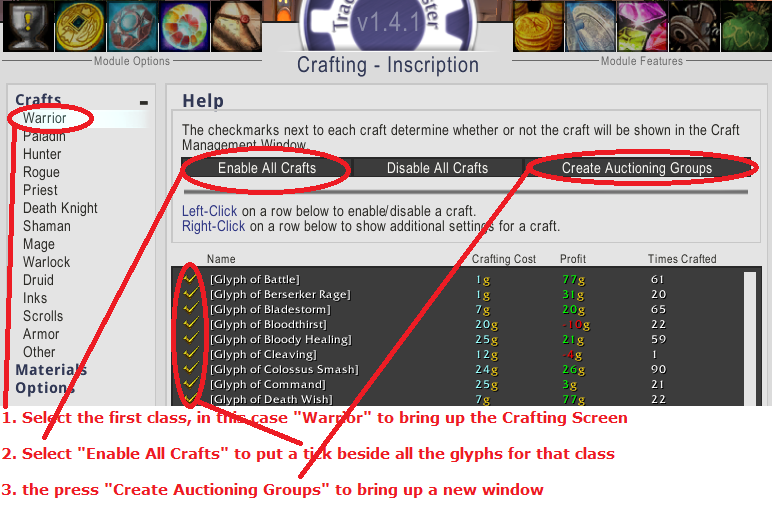 In the "How to add crafts to Auctioning" select "All in the Same Group"
3. 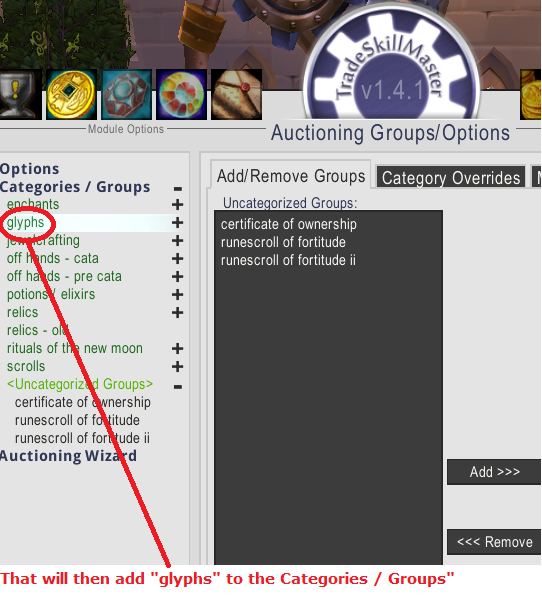 Tick the box "only include Enabled Crafts"
4. 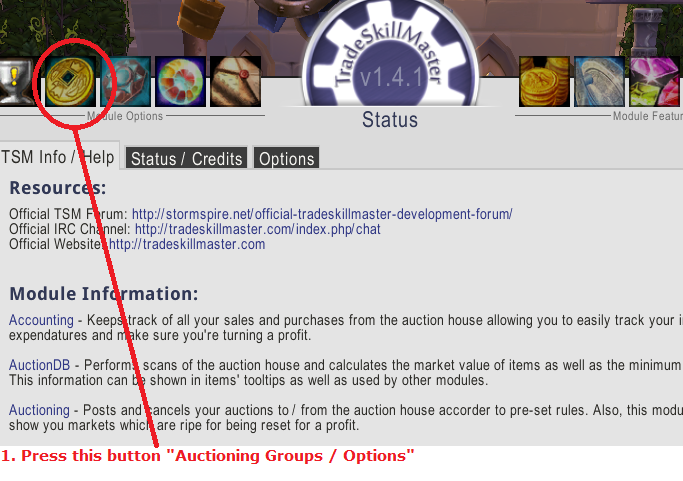 Press the "Add Crafted Items from this Group to Auctioning Groups" button. and now we have added all Warrior glyphs to our "glyphs" category. back on the auctioning page we can check this by looking at our category list. 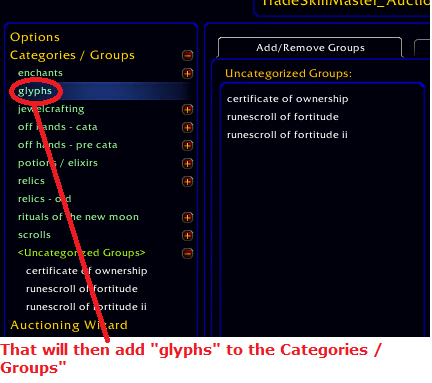 Expand "glyphs" and it will show "inscription - warrior" as shown in the graphic below. 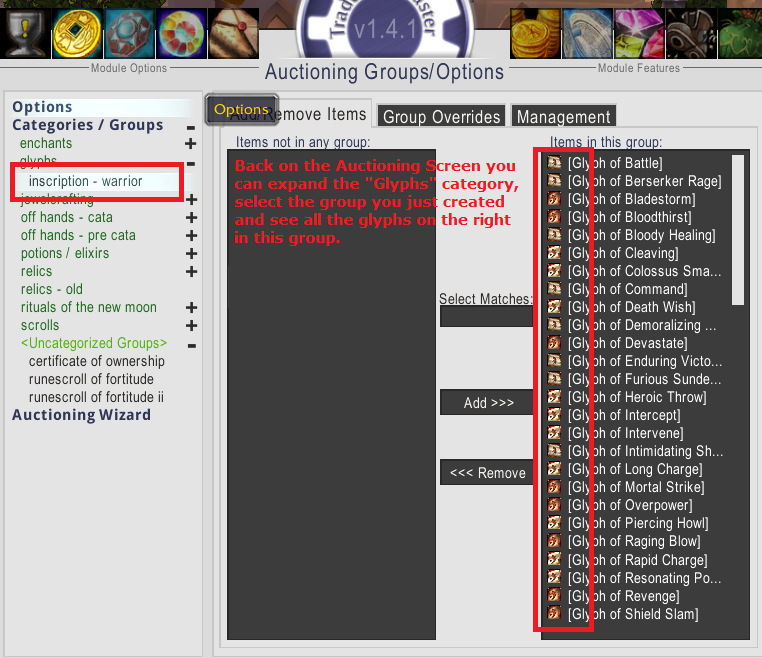 Select "inscription - warrrior" and it will show all the warrior glyphs as also shown in the graphic below. Repeat the above process for all classes and you will end up with what looks like the graphic below. In my "glyphs" category i have all the classes added. If selected one of these classes it would show me all the glyphs which have been added. and that is it all done! 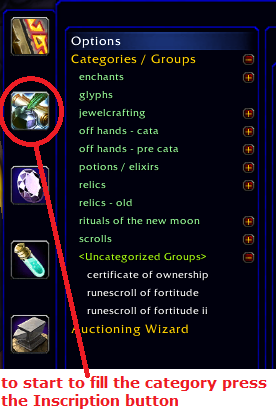 when i go to the Auction House with whatever glyphs i have on the character at the time and press "Post Auctions" it will post the glyphs at a maximum of 2 single glyphs or each glyph at a minimum price of 40 gold, a fall back price of 600 gold and undercut by 10 silver. great job...I bookmarked it so I can go through it in detail tonight...GREAT POST!